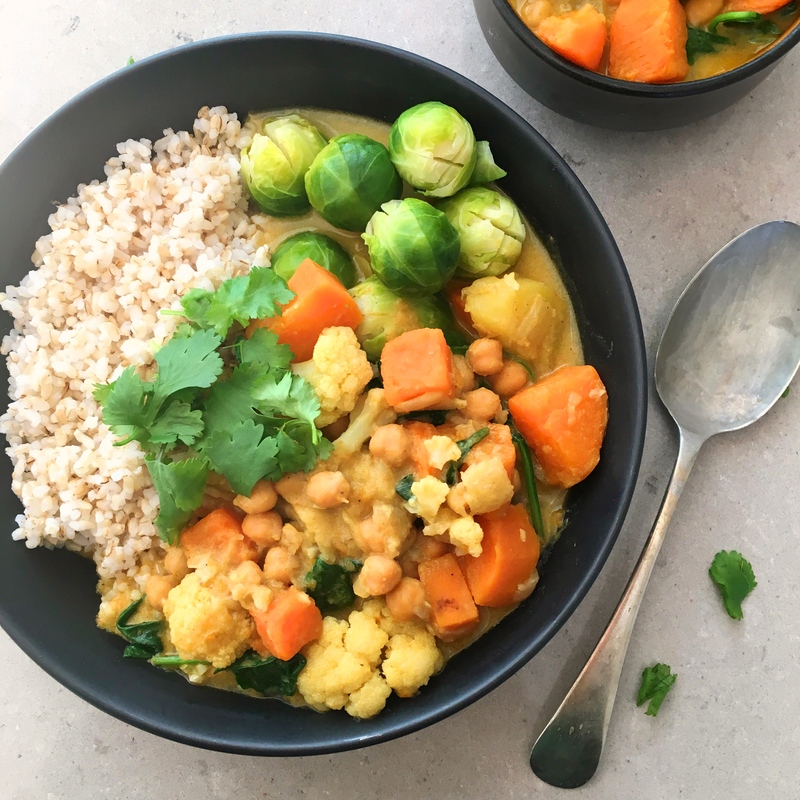 This Sweet Potato and Chickpea Curry recipe is from our blog on fibre and the importance of eating enough fruit and vegetables. You can check it out HERE. Heat oil in a large saucepan over a medium heat. Add diced onions and cook until soft (1-2 minutes). Stir through the spices and garlic, and cook for another minute or so, until fragrant (don’t let the spices burn!). Add the chopped carrot, sweet potato, potatoes and chickpeas, and stir to combine. Add the stock and coconut milk, cover with the lid and bring to a boil. Once boiling, reduce the heat to low-medium, and cook for 20-30 minutes, until the vegetables are cooked through. Add the cauliflower florets and lime juice, and cook for another 5-10 minutes, until the cauliflower has softened. Stir through the spinach and season to taste*. I like to serve this curry with brown rice or quinoa, a side salad and/or some steamed greens. It is also delicious sprinkled with some fresh coriander and a squeeze of lime. *This Sweet Potato and Chickpea curry is very yummy albeit quite mild, so it will hopefully appeal to the whole family. If you prefer a stronger flavour, feel free to add extra curry powder or some chilli. If you need more liquid, you can add more coconut milk, vegetable stock, water or something like Coco Quench. Adding more coconut milk is my preferred option, as it makes the curry extra creamy. If your curry is too liquid-y, remove the lid and cook for 10-15 minutes over a medium heat, to evaporate off some of the liquid. This also helps breakdown some of the sweet potato and potato, which will help thicken it up a bit.